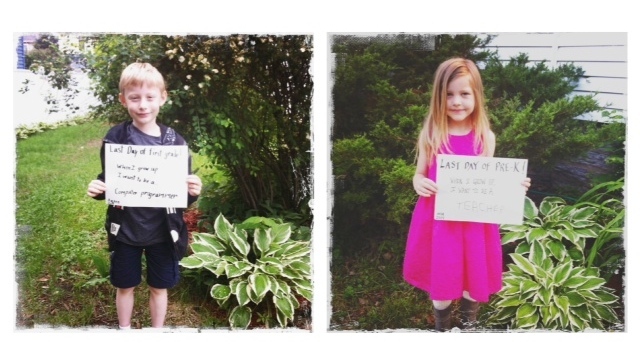 The last official day of school has arrived for my little ones, and I’m emotionally all over the place. My first thought is that I cannot believe another year has slipped through my hands. The daily hustle-and-bustle clouds how much time is passing, and suddenly the school year is over. Aanen will be a second grader, while Aria will be a full-time kindergartender– no more half days with my little girl at home. Ugh… My second thought is a little less melancholy and a lot more pressing. What on earth am I going to do to entertain these children all summer long?! I have a few ideas circling in my head– and I’m sure we’ll have a wonderful time– but still the concern is there. Swimming, biking, basketball, reading, exploring, and more kid-assisted baking, I’m sure. Speaking of baking (how’s that for a transition?) 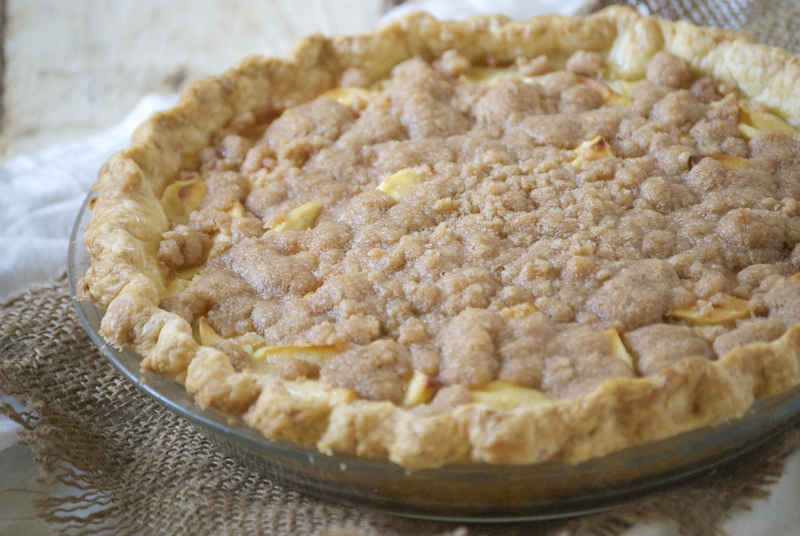 the weather has been a bit cooler, so I made this pie especially for my hubby (you all remember his favorite Sour Cream Apple Pie, right?) This pie is a variation of that masterpiece. And though I made the pie for him, I did my fair share of helping him eat it. I’m usually fairly disciplined when it comes to baked goods and I try not to over-indulge. Apparently this pie was the breaking point and soon I was eating pie for breakfast, followed up with pie for a snack. I’ll be sure to not make it again for a long time, as apparently I can’t say no to it. 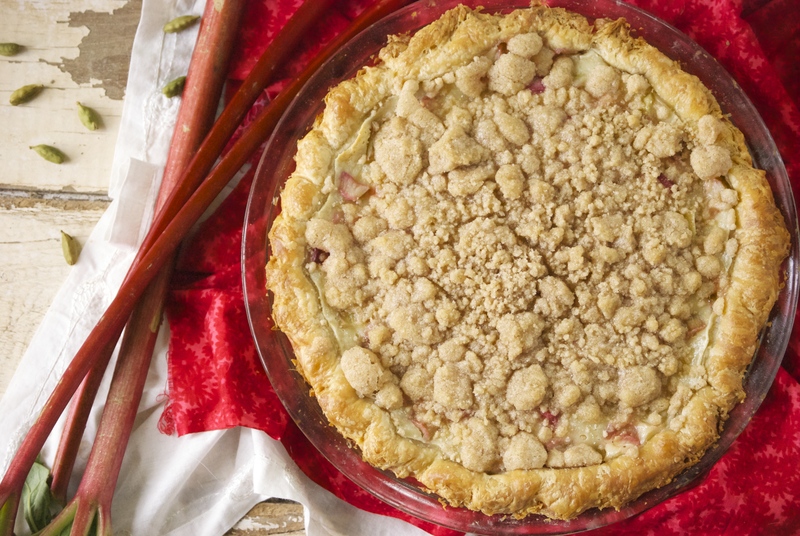 Cardamom and rhubarb is one of my favorite fruit-and-spice combinations. If you haven’t tried it, do so. Add more cardamom for a stronger flavor, if you prefer. I wanted it to be ever-so-subtle, as I really relish the pure taste of rhubarb and I didn’t want that to be lost. 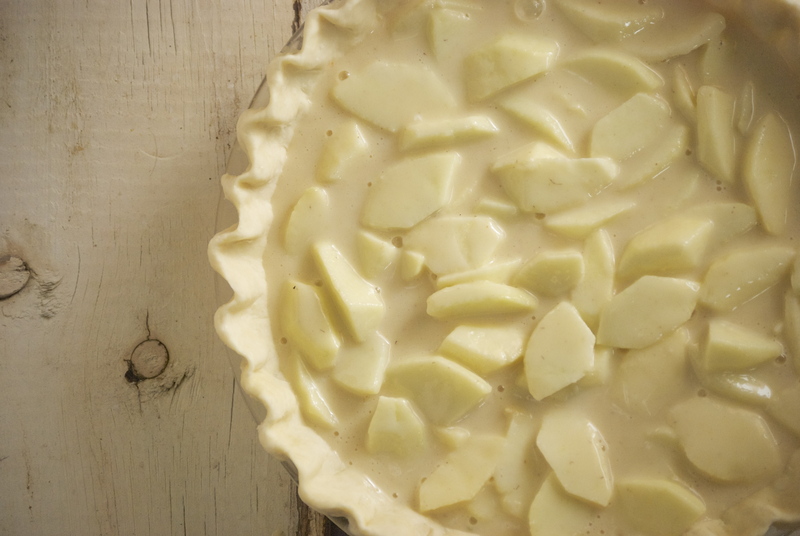 One important factor is to serve the pie cold from the refrigerator. It’s just so much better that way. 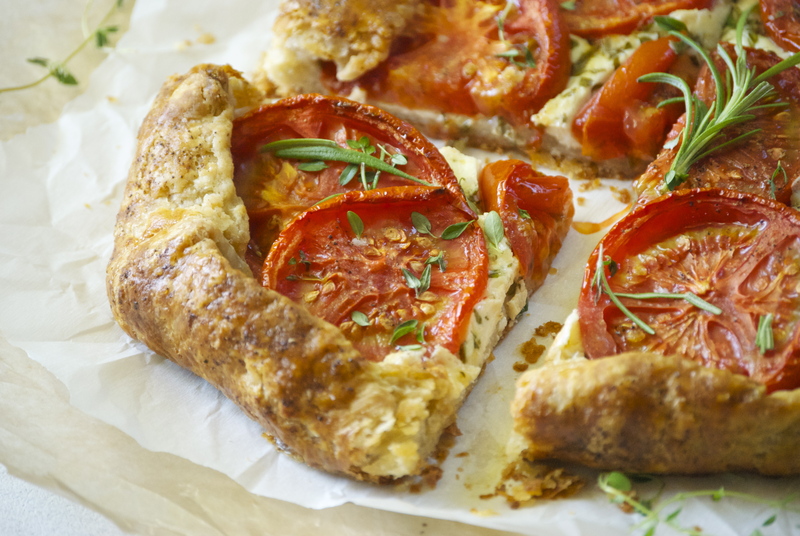 The crust holds up beautifully and still remains flakey and crisp. It will last for days when covered lightly with plastic wrap. Enjoy the heck out of this one, friends. Follow the recipe and instructions from this recipe to prepare the pie dough. You will only use 1/2 of the amount. To Make the Crumble Topping: In a small bowl, stir the dry ingredients together with a fork. Then, using that fork, cut the butter into the mixture until it’s crumbly and everything is incorporated into the butter. Store in the refrigerator until ready to use. 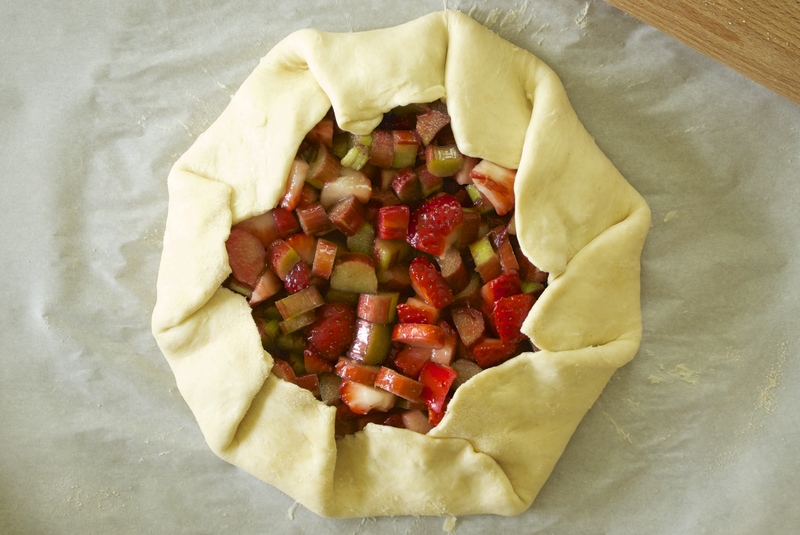 To Make the Rhubarb Cardamom Custard Filling: Beat together the first 6 ingredients in a medium-sized bowl until smooth. 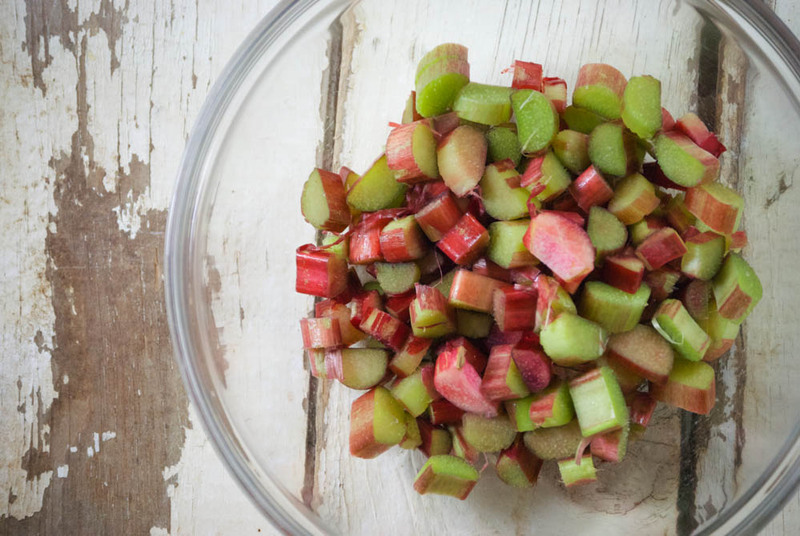 Then stir in the rhubarb. Set aside. 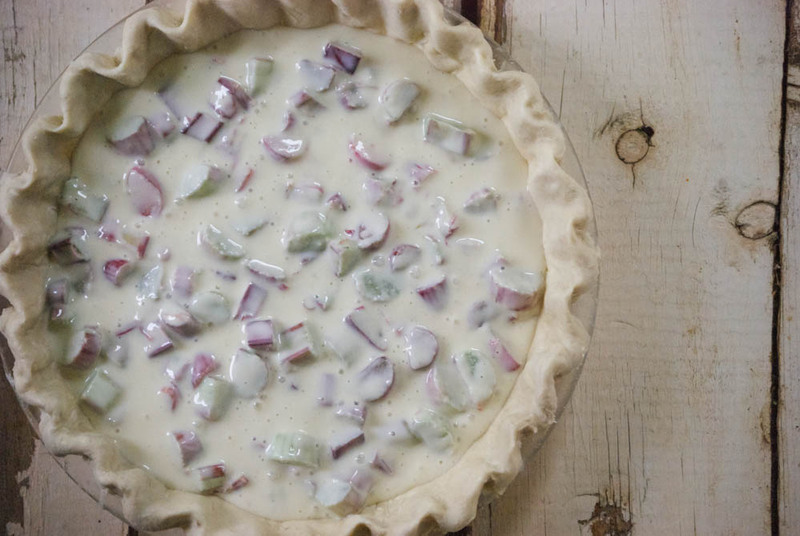 Shape the pie dough into a 9-inch pie plate. Pour the rhubarb cardamom custard filling into the pie. Bake for 15 minutes. Then reduce heat to 350°F and bake for another 30 minutes. 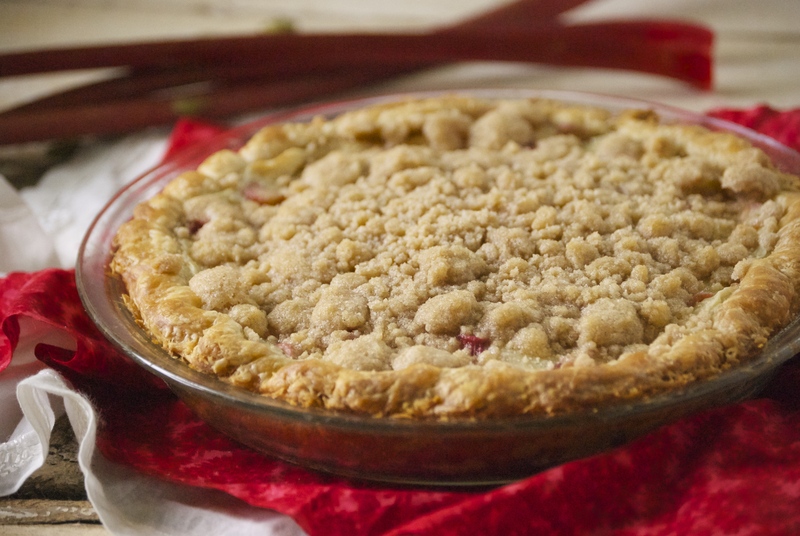 Remove pie from oven and add the crumble mixture evenly to the top of the pie. Return to oven and increase the heat to 400°F and bake for 10 more minutes. Remove from oven and let cool completely on a cooling rack. Cover loosely with plastic wrap and place in the refrigerator. This pie is best served cold and will keep for days. Enjoy! If you’re a regular visitor to my little corner of the internet, today’s recipe will come as no surprise. But for those of you new to Relishing It, witness my obsession with galettes. 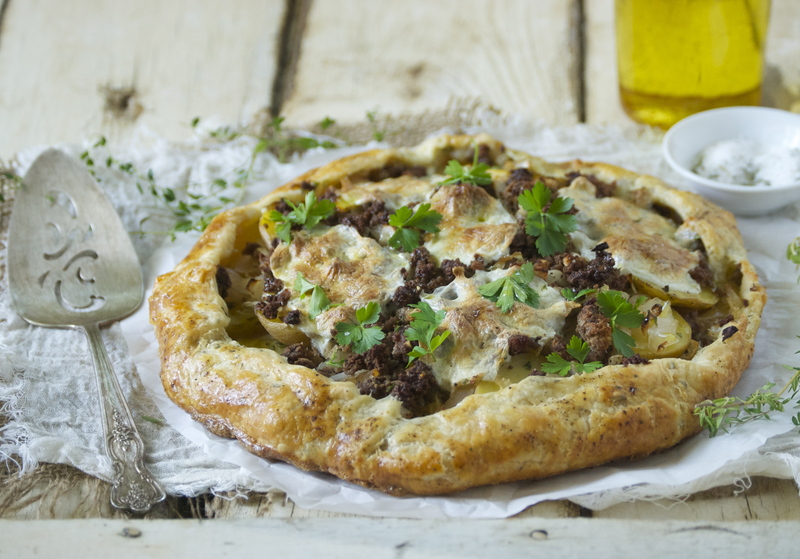 Sweet or savory, I love a good galette. They’re so versitile, tasty, and just gorgeous. 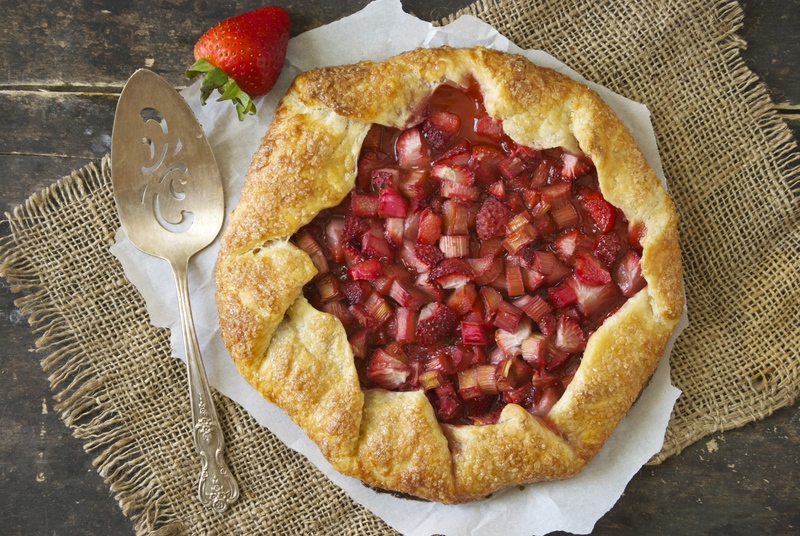 Since we’re rolling right into Spring/Summer and there’s so much wonderful fruit, that means that we are rolling right into galette season, too. I spent the better part of a recent rainy afternoon stocking my freezer with homemade pie dough, so I have it at the ready whenever I get the inclination to whip up a galette. Having the pie dough at my disposal makes things a bit easier. Not that making it is difficult– it isn’t. It takes less than 5 minutes to make a batch of pie dough. No lie. 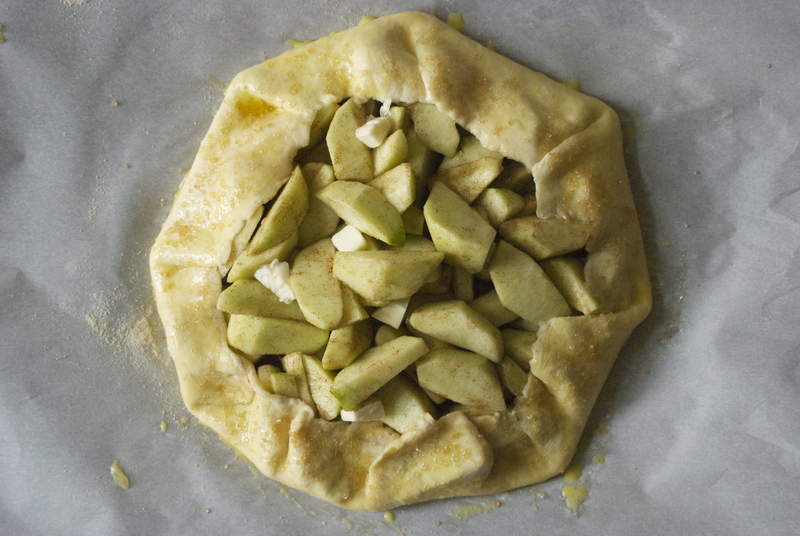 And the galette itself is almost foolproof. Even the imperfections give it a rustic look that I love. Being a food blogger, there is a certain amount of self-promotion on social media that you have to do in order to tell people that “Hey, I wrote a post and it’s worth reading”. It’s something that in the beginning of blogging feels silly and awkward and then 3 years later, you don’t give it another thought. It’s all part of the process and I get that. You want to convey how wonderful and delicious something is, without sounding like a grand-standing braggert. 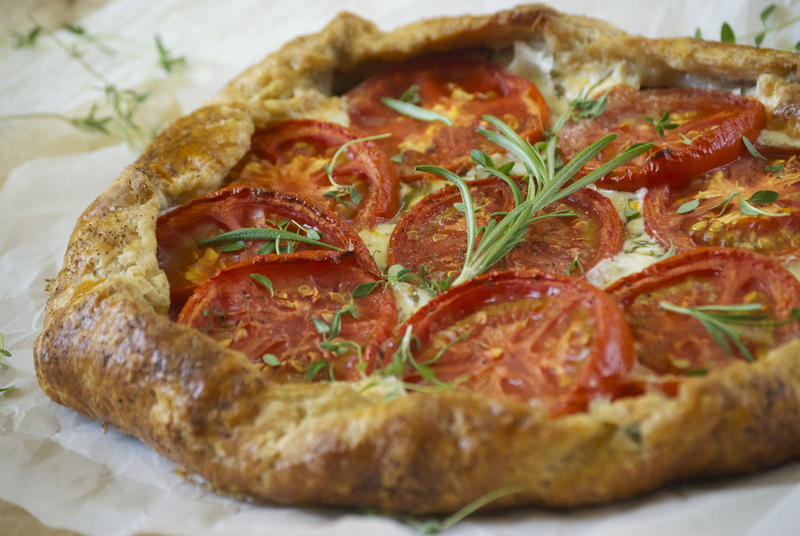 So, with this in mind– when I tell you I make killer galettes, I mean it. Really. They are so damn good that I wish I could eat one everyday for every meal. There I said it. I’m a braggert now. The key is the crust. 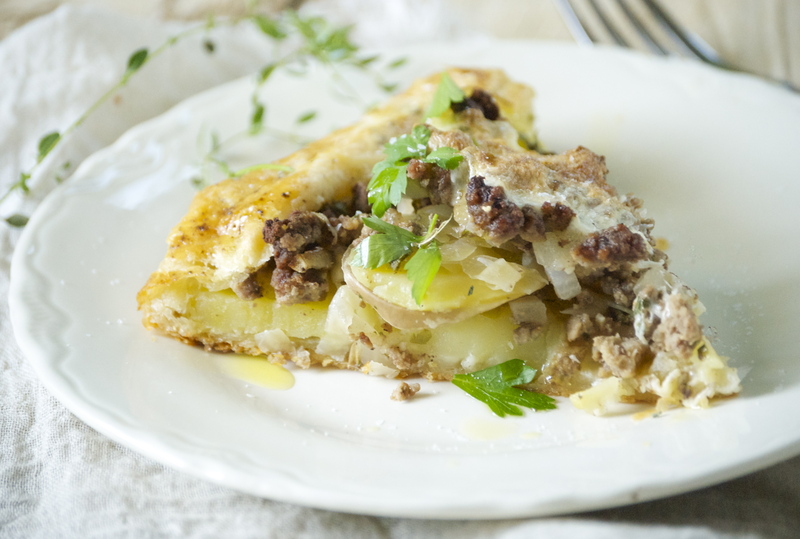 It’s buttery and flakey…. and buttery. Did I mention that it’s buttery? It has a wonderful crunch and the right amount of tenderness. And it comes out perfect every single time. No guess work. Just follow the recipe and directions. Use frozen, grated butter– it never disappoints. 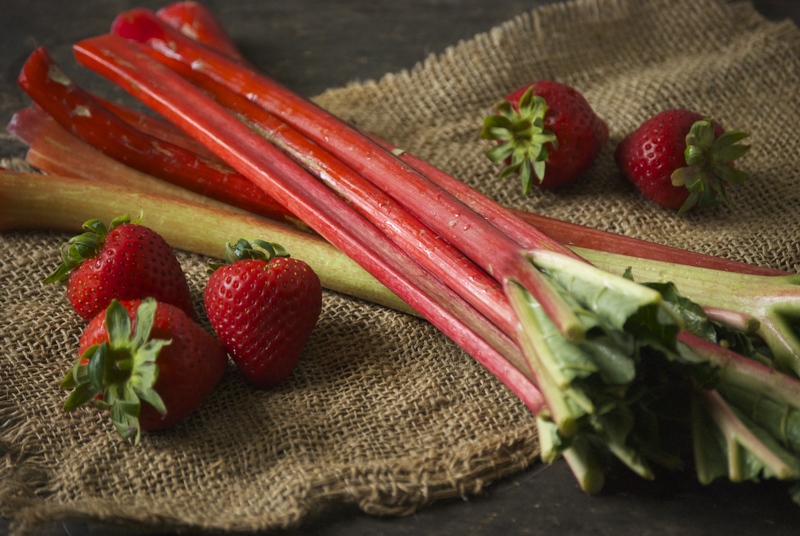 In this version I wanted to use some delicious Spring rhubarb. 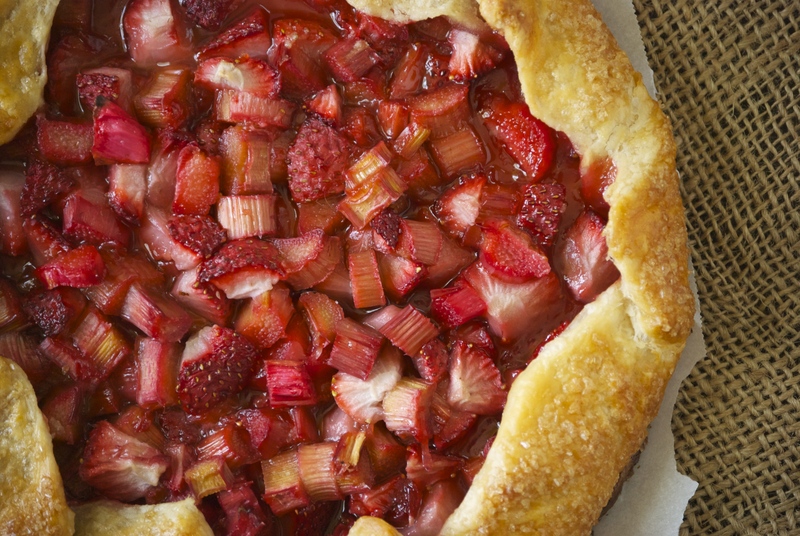 I generally am a straight-up rhubarb gal, but my family loves strawberry with it. They work well together. 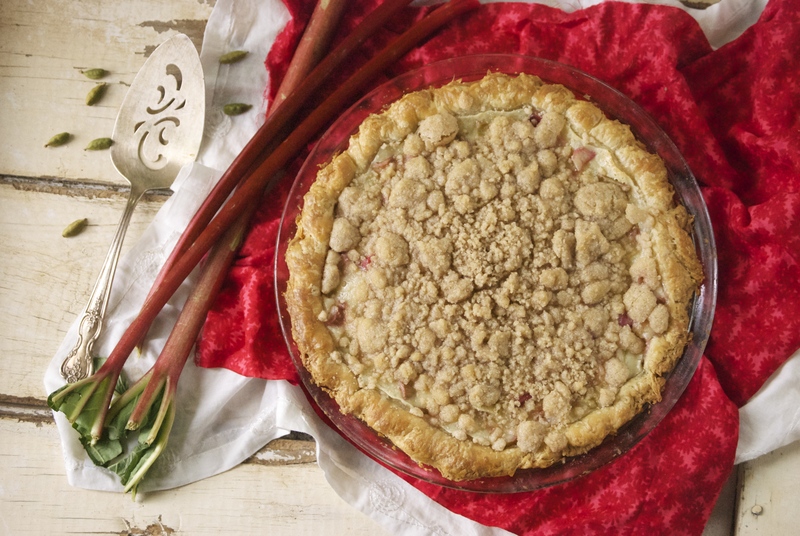 I made sure to not sweeten it too much, as I still love the tartness from the rhubarb. I think this galette reaches the perfect balance. Not cloyingly sweet, and not too tart. Perfection. Give it a try for yourself and make sure to share. 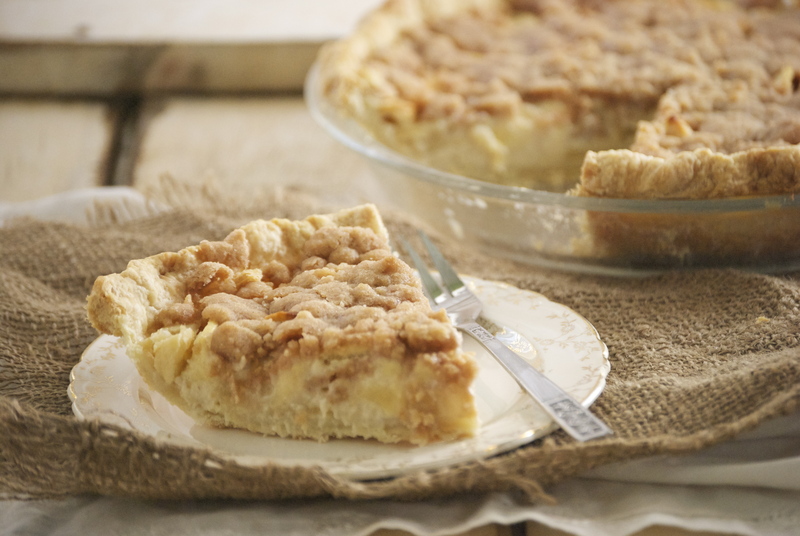 Follow the recipe and directions for the All Butter Pie Crust. You will only use half of the recipe, but make the entire amount. The other half will keep in the freezer until you are ready to use it. Thaw in the refrigerator the night before use. Preheat the oven to 375 °F. Place the oven rack in the middle position. Have a baking sheet ready for the galette. 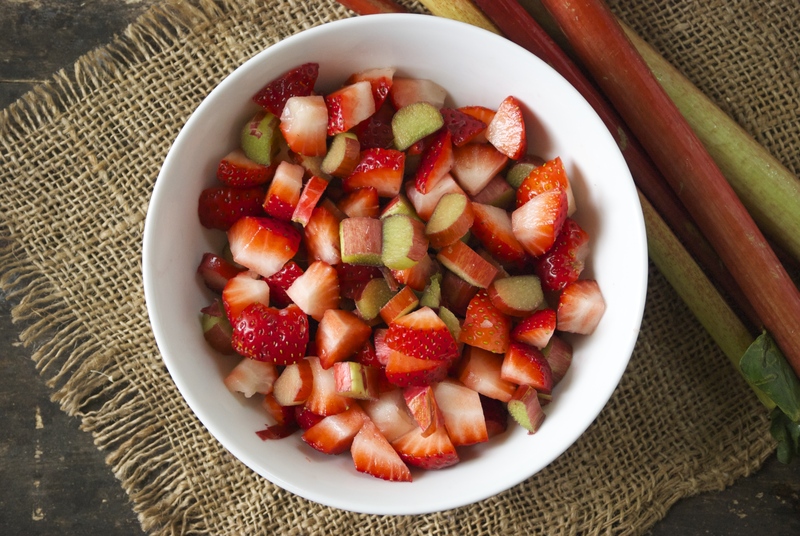 In a medium-sized bowl, mix the rhubarb, strawberries, cornstarch, sugar, and pinch of salt together until everything is coated. Set aside. Lightly sprinkle flour on a piece of parchment paper that will fit onto your baking sheet. 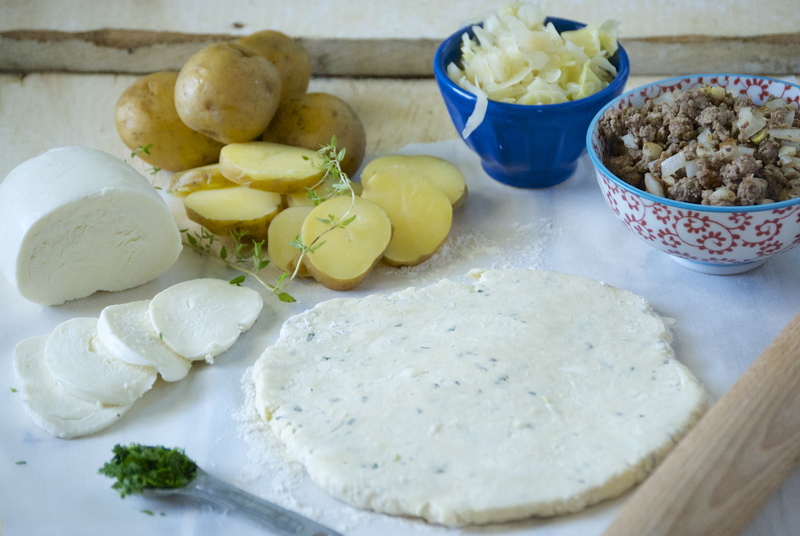 On a flat surface, place the dough in the center and use a lightly floured rolling pin to roll out to 12-inches. 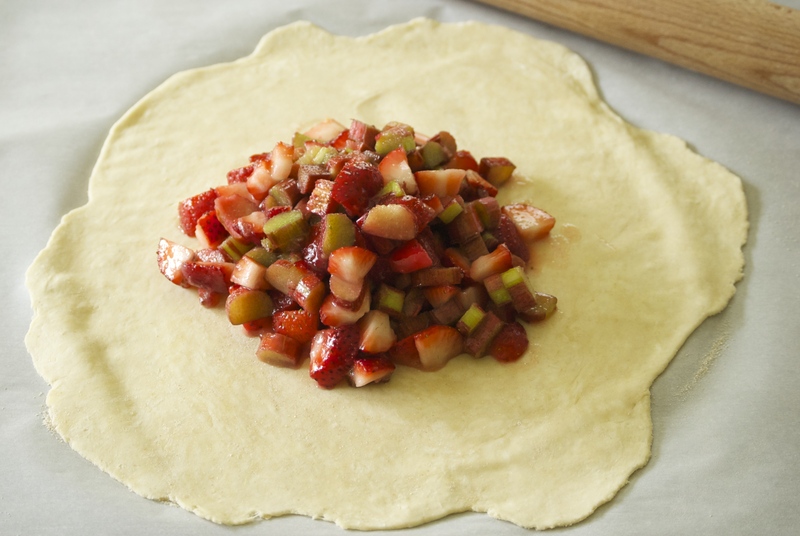 Pour the fruit mixture into the center of the dough. Flatten the mixture a bit with your hands. Fold up about 1 1/2-inches of the dough around the edge. Make sure to pinch the seams together along the way. Then use a pastry brush to apply the egg wash. Sprinkle with turbinado or demerara sugar. 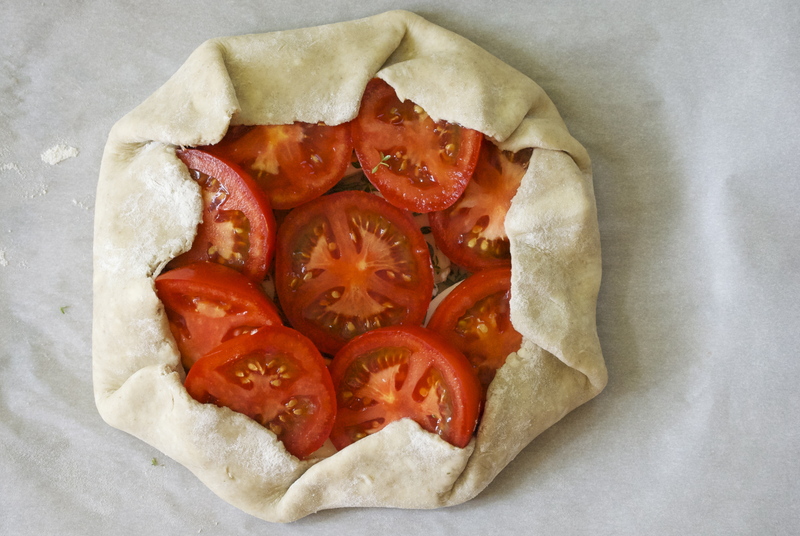 Place the galette and parchment paper onto the baking sheet and into the oven. Bake for about 45 minutes, or until the crust is a deep golden brown and the liquid bubbles a bit. 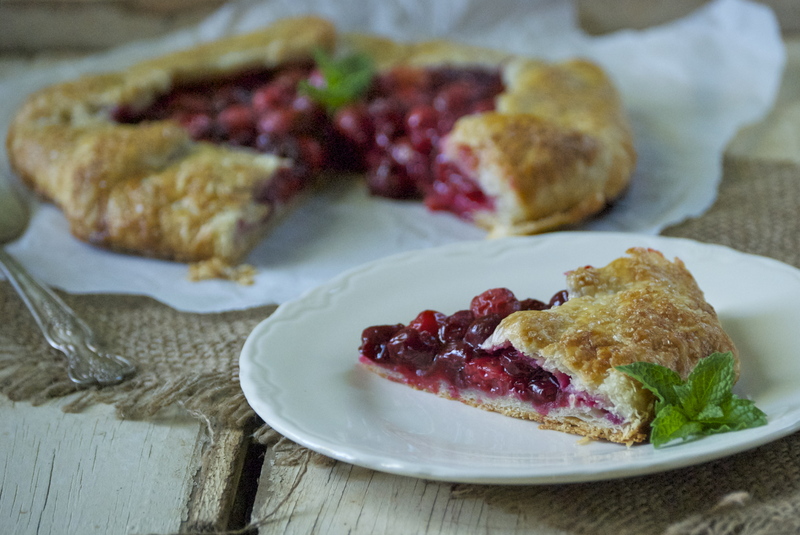 You may see some liquid run from the galette during the baking process if the seams didn’t get adequately sealed. Don’t worry, it’ll turn out just fine. Let cool before cutting into it. 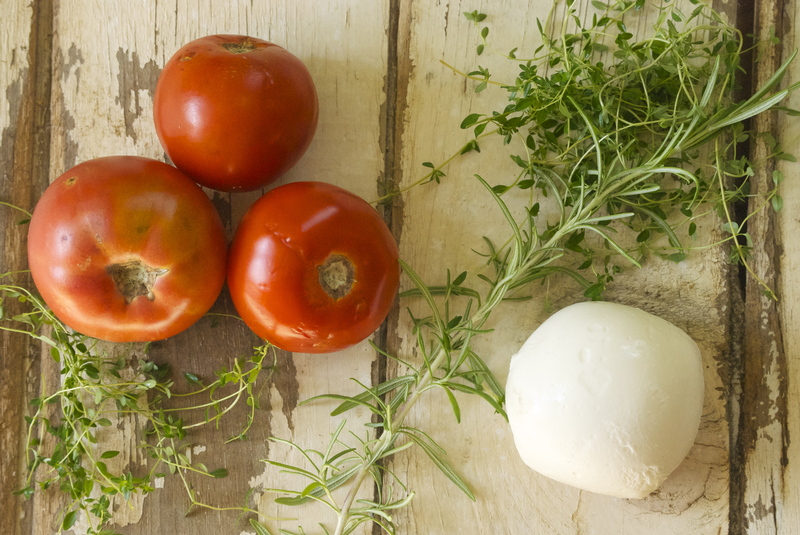 Simply cover leftovers with a dishtowel, if there are any. Enjoy! Thanks for visiting today– have a great weekend! I thought I’d share my husband’s all-time favorite pie with you today. 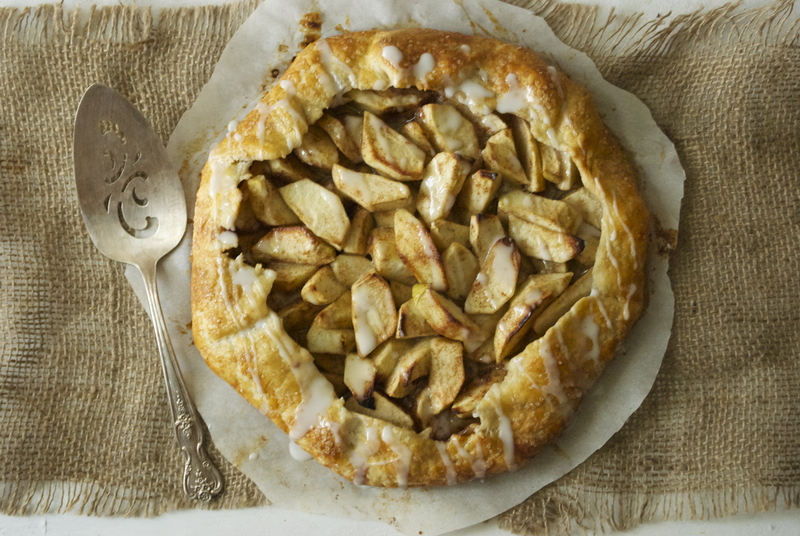 It’s an interesting twist on the typical apple pie, and it would make a great Thanksgiving-day dessert. I’ll explain the pie in a minute, but first I want to take a moment to talk about my husband– because that’s way more fun. Radd. Yep, that’s his real, full, first name. The one his parents made-up and named him, though according to family lore, it was mostly his mom’s choice. I think it’s one of the best names I’ve ever heard. And I’ve never heard anyone else with it– it’s unique, which suits him. Radd and I started dating in high school, a looong time ago. He had this gangly teenage-boy body that looked too small for his large head, while I was sporting huge early 90’s hair to go with my rolled jeans, and a mouth full of braces. We really were just kids. We ventured off to college together and he became my home, so to speak. You know that feeling– that wherever you are together is home and quite possibly the most comfortable place in the world. Yes, that feeling. Why am I writing about this now? Well, we recently celebrated Radd’s 40th birthday. And while I was excited to celebrate this milestone with him, I was also taken aback. 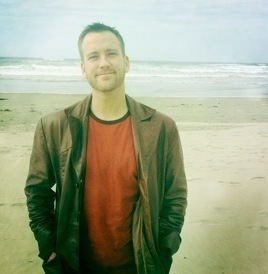 I had a hard time wrapping my head around the fact that this boy I’ve been with for 23 years is now a middle-aged man. Where did the time go? At any rate, I adore him. He’s intelligent, hilarious, bizarre (in a great way), and an incredible dad. Not to mention, he understands me– I mean really gets me. Which is probably the most important thing of all. Now to the pie that I made Radd for his birthday. 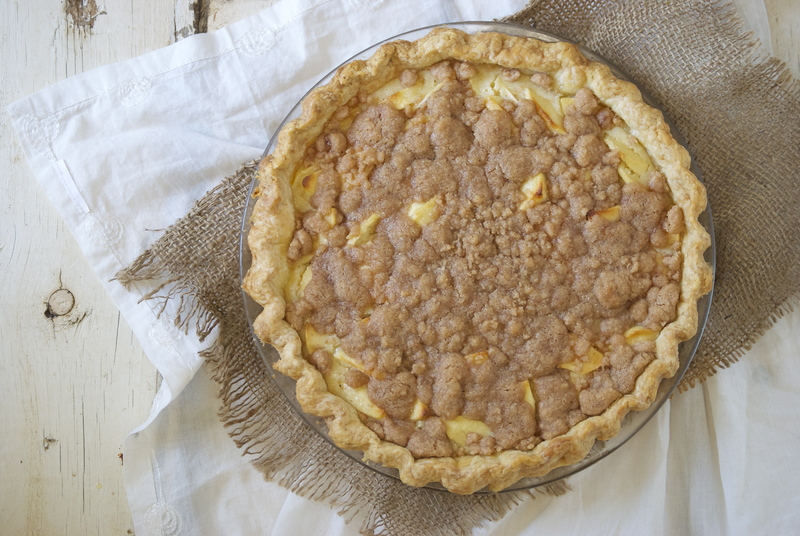 This Sour Cream Apple pie is his favorite. Full Stop. The recipe comes from my Mom– she made it for him once many years ago and he’s loved it ever since. 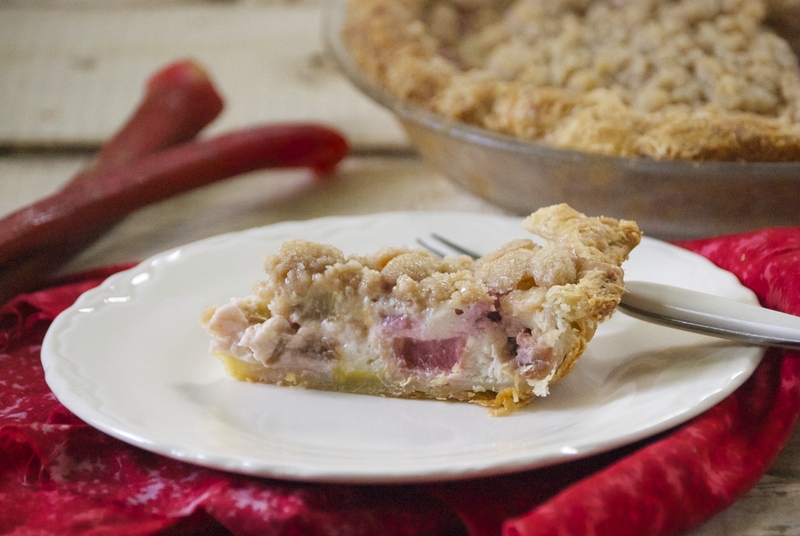 It’s a delicious apple crumble-like pie with a lovely slightly tart sour cream custard-like filling. There are notes of nutmeg (which is one of my favorite spices) and cinnamon. Taken as a whole, it’s pretty amazing. This pie is perfect for Thanksgiving, or any type of entertaining, because it actually gets better if it’s left in the refrigerator for a day. The custard has time to set up and the flavors seem to meld even more after a bit of time. Though, I know that some of you prefer a warm apple pie, so feel free to bake it at the last minute. Whichever you prefer, I’m sure you’ll enjoy it. 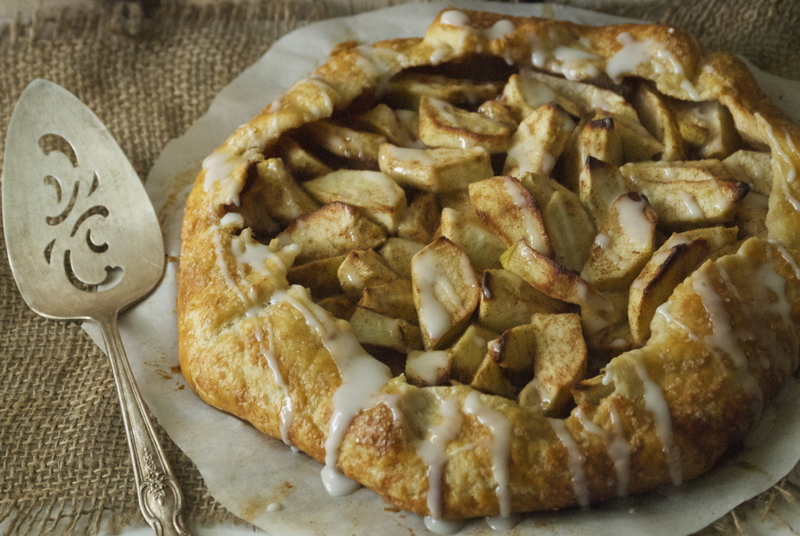 Need more great Holiday dessert ideas? This Brown Butter Pumpkin Layer Cake and this Bourbon-Chocolate Pecan Pie remain some of my all-time favorites. Follow the recipe and instructions from this recipe to prepare the pie dough. Either make the entire recipe for the dough, and save half for later. Or simply make only half of the recipe. You decide. To make the Crumble Topping: In a small bowl, stir the dry ingredients together with a fork. Then, using that fork, cut the butter into the mixture until it’s crumbly and all of the dry ingredients are incorporated into the butter. Store in the refrigerator until ready to use. To make the Pie Filling, beat together the first seven ingredients in a medium-sized bowl until smooth. 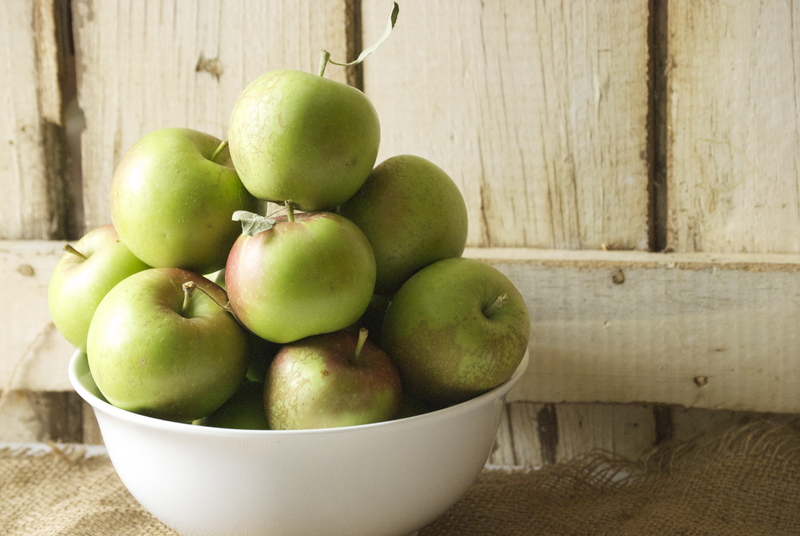 Gently stir in the apples. Set aside. Shape the pie dough in a 9-inch pie plate. 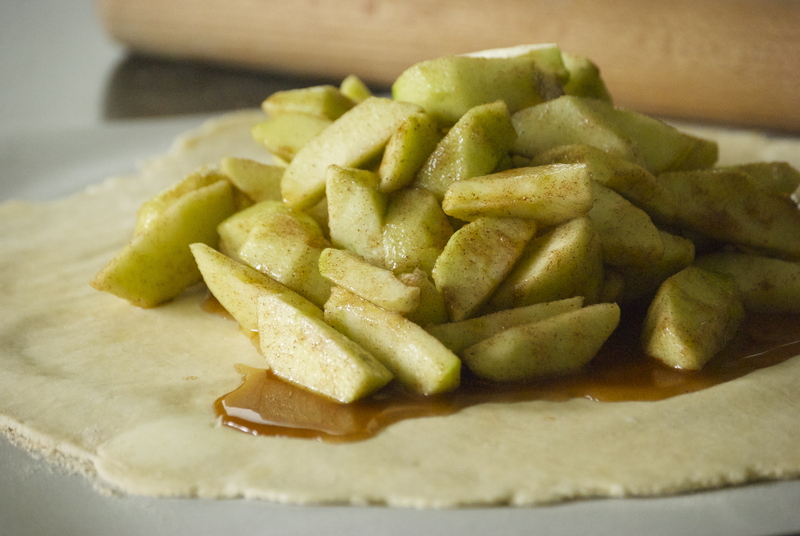 Pour the apple/sour cream filling into the pie. Bake for 15 minutes. Then reduce heat to 350°F for 30 minutes. Remove pie from oven and add the crumble mixture to the top of the pie. Return to oven and increase the heat to 400°F and bake for another 10 minutes. Remove from the oven and let cool completely on a cooling rack. Cover and place in the refrigerator if wanting to serve it cold. Enjoy! I wait all year long for sour cherries to come into season. They are my absolute favorite fruit to bake with, just nudging out blueberries. Sour cherries have such a unique flavor– that brilliant tartness which I soften with a bit of sugar. 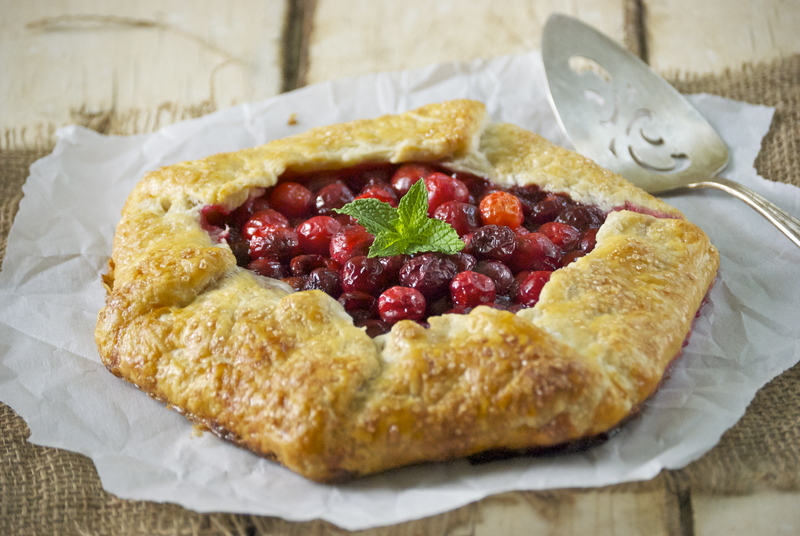 Today’s recipe is a wonderful sour cherry galette that is perfect for capping a summer dinner on the patio. If you can get your hands on a few baskets of sour cherries, I can’t think of a better way to showcase them than in this dessert (or breakfast– no judging). 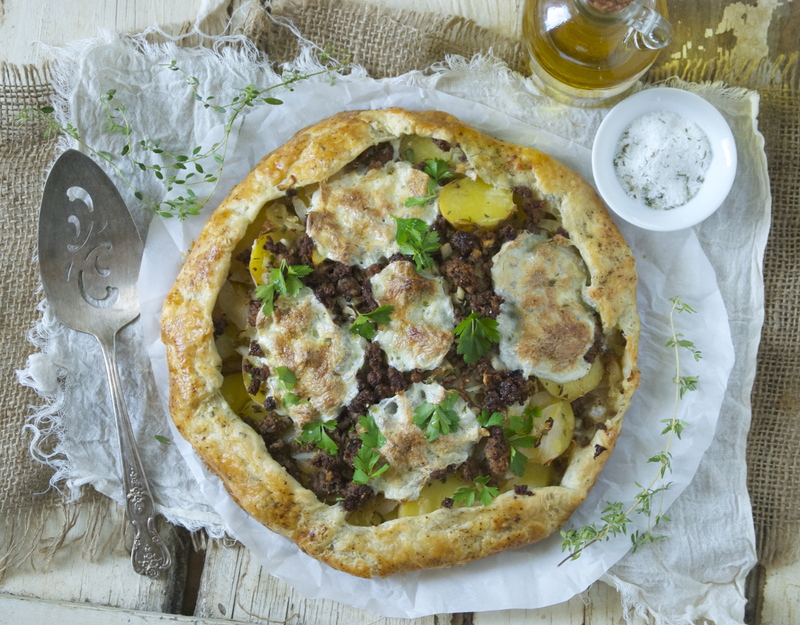 I love the simplicity of the galette–there’s just something genuine about it’s rustic look. 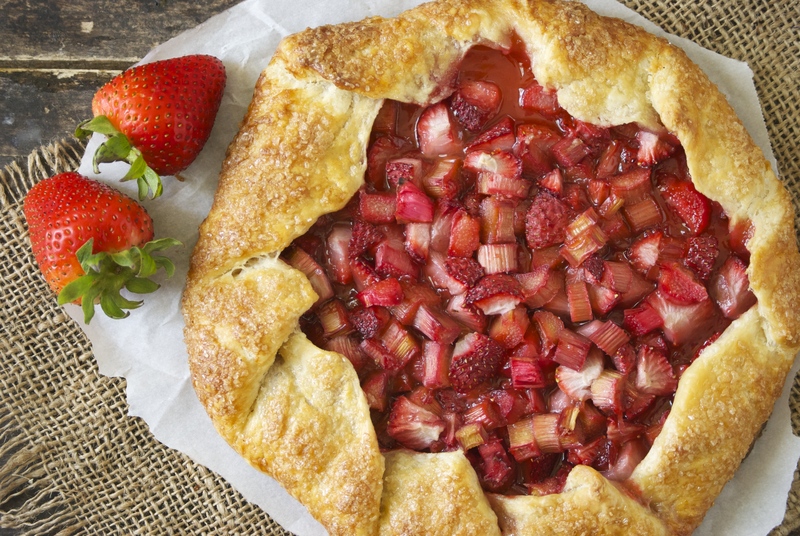 And the fruit-to-crust ratio is perfect. 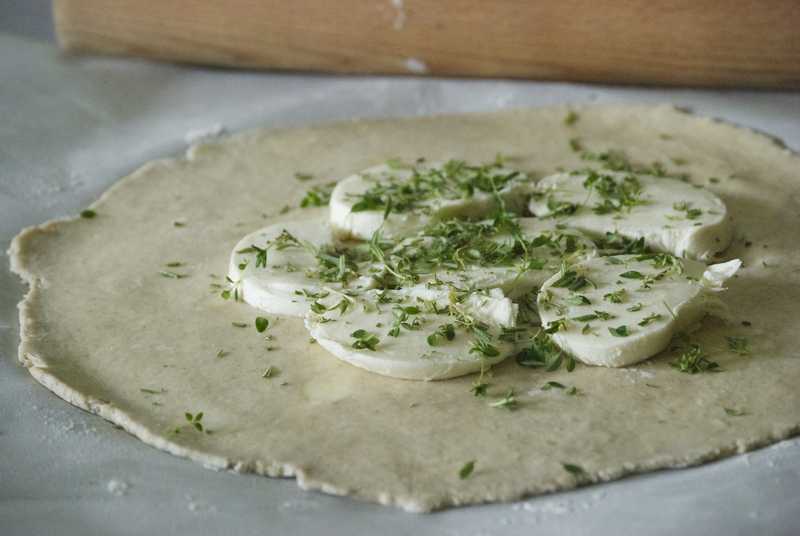 Galettes have another advantage– they’re virtually foolproof. The crust is my go-to all purpose pie crust. It’s an all butter crust, so there’s no shortening or lard. I know that some folks incorporate other fats into their crust because they say it makes it a bit crispier. However, this one is perfectly crisp, and I try to avoid cooking with those sorts of fats. The trick here is to use very, very cold butter. So cold, in fact, that most times I use frozen butter that has been run through a large box grater. 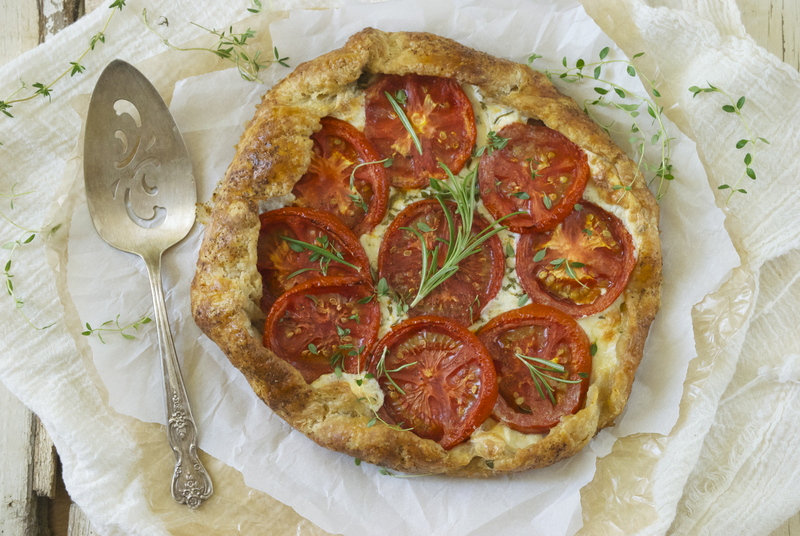 The other key here– whether it’s in a galette, pie, scones, or biscuits– is to not overwork the dough. Yes, you still have to use your muscles a bit, but the less you work it, the better it tends to be. My food processor gets a break when I make pie crust. I feel more in control if I do it by hand using my pastry blender. If the butter becomes too soft, just pop it in the freezer for a few minutes. You get the idea. 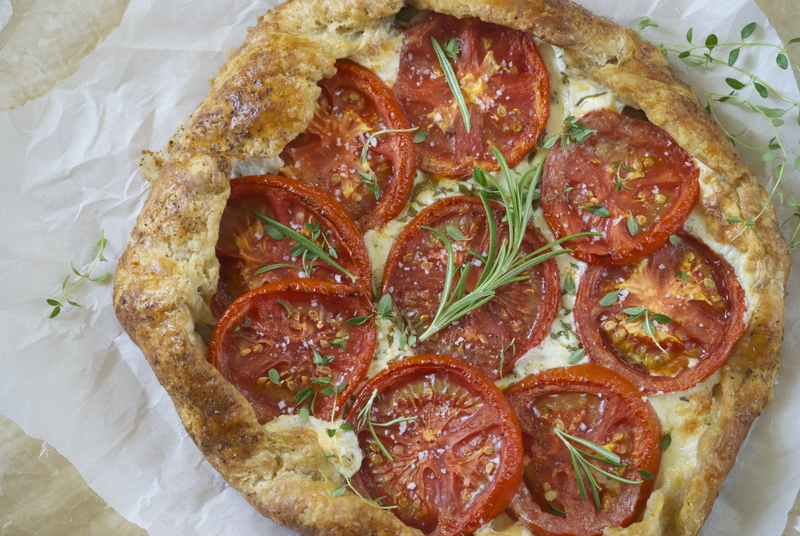 If you haven’t made a galette before, this is a great place to start. It’s also easy to make with fresh blueberries– just dial back the sugar to 1/4 cup. Enjoy! To make the pie dough: Pour the water into a large measuring cup. Add a couple of ice cubes. Set aside. 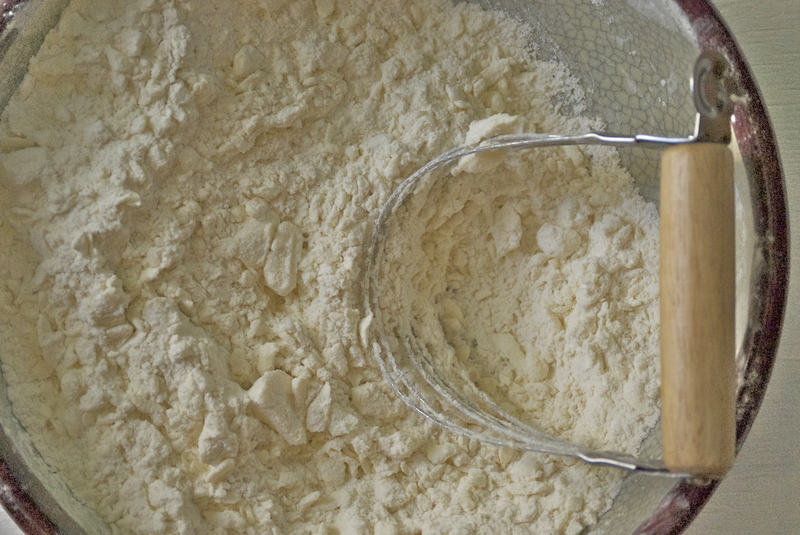 In a large bowl, whisk together the flour, salt, and sugar. Set aside. 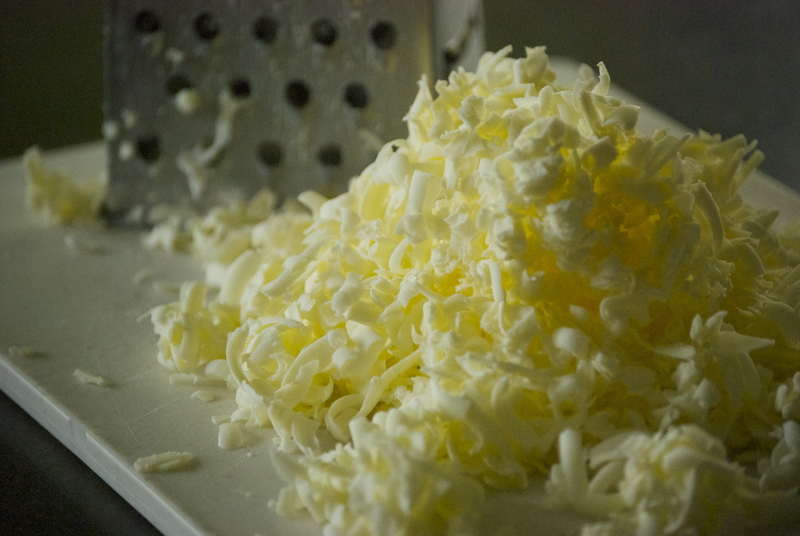 Using the large holes of a box grater, quickly grate the frozen butter. 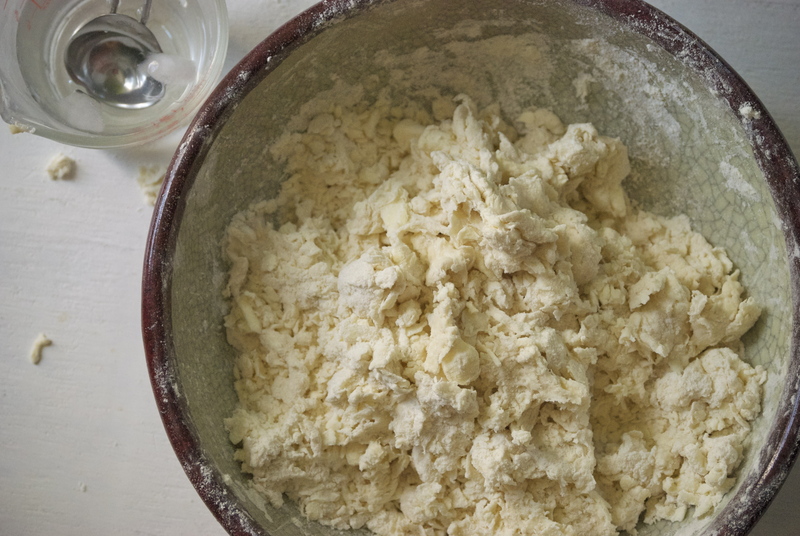 Place the butter into the bowl with the flour mixture. 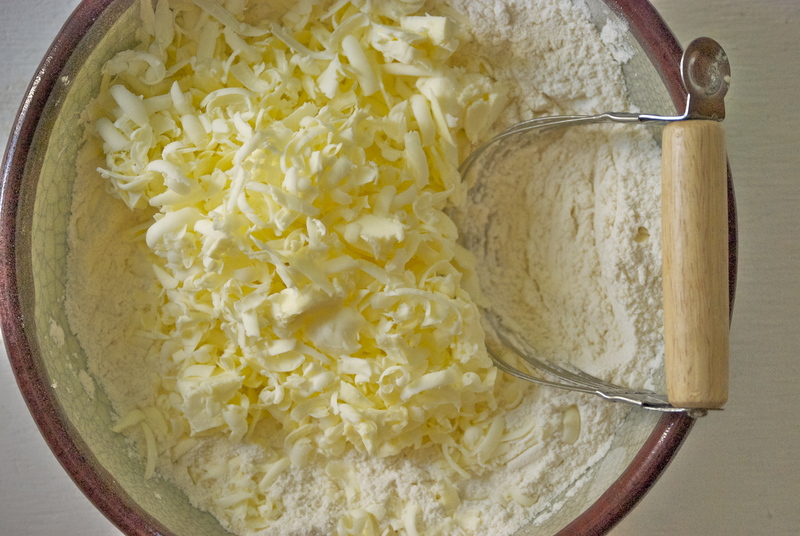 Using a pastry blender, quickly work the butter into the flour until the mixture resembles small peas. Feel the butter, if it doesn’t feel very cold, you can place it into the freezer for a few minutes. Continuing, measure out 1/2 cup of ice water (careful not to add the ice cubes) and using a rubber spatula incorporate the water into the butter/flour mixture by folding it in. Add more water, if necessary, a tablespoon at a time. Three tablespoons does the trick for me. The mixture will look like a shaggy mess. Press it together and if it sticks, but isn’t sticky– it is ready. You don’t want it wet, but you don’t want it dry either. 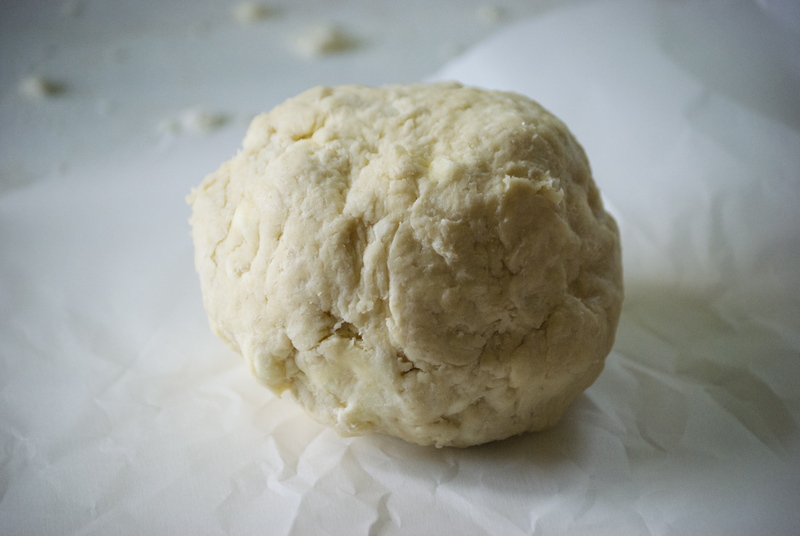 Knead it together with your hands a couple of times to form a ball shape. 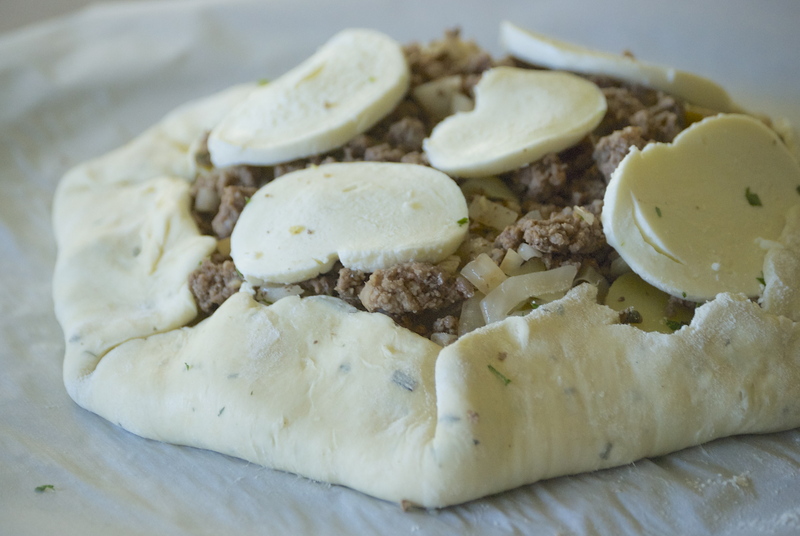 Divide the dough into half and wrap each half into plastic wrap. Refrigerate for at least 1-2 hours before using. Or freeze for months and thaw in the refrigerator. For this recipe, you will use only 1 of the balls of dough. Save the other one for another time. Preheat the oven to 375°F. 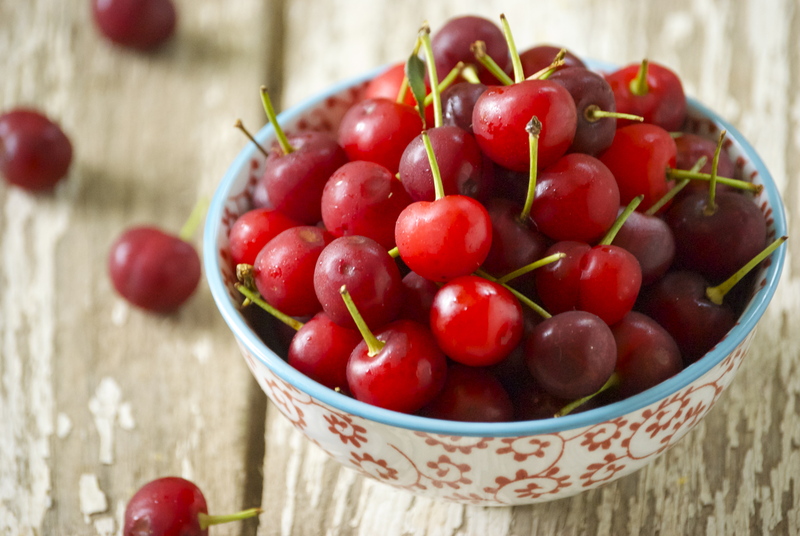 In a medium-sized bowl, stir the cherries, sugar, cornstarch, and salt together. On a large piece of parchment paper that will fit onto a large baking sheet, sprinkle a tiny amount of flour onto the paper and onto your rolling pin to help it roll out more easily. 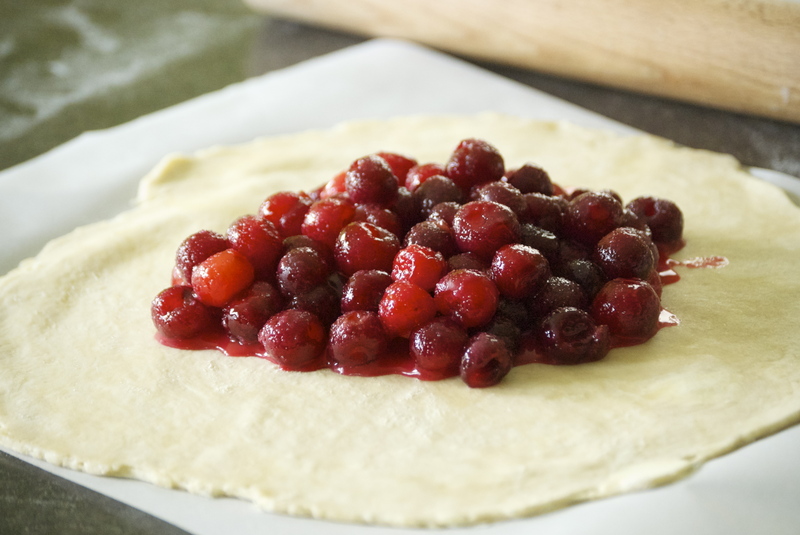 Roll out 1 ball of pie dough into a 12-inch circle on the parchment paper. 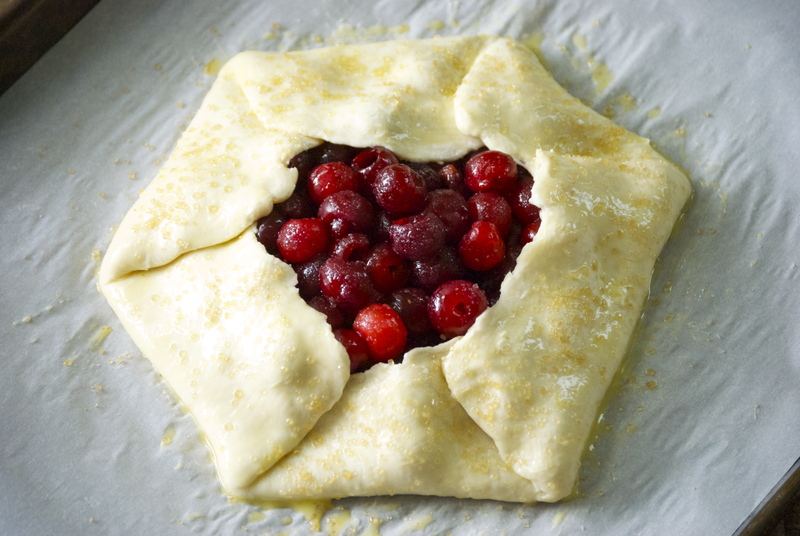 Place the cherry mixture into the center, and carefully fold the sides over each other. Press them together so they adhere– this will help prevent too much cherry juice from leaking when it bakes. 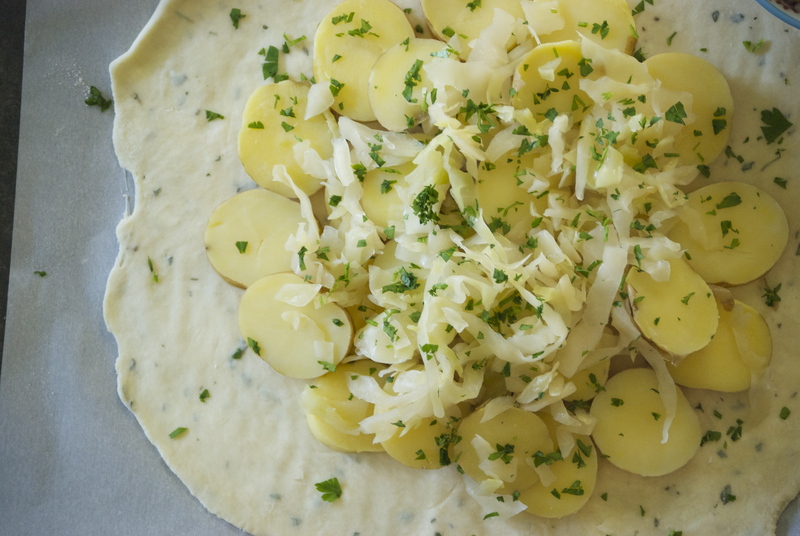 Gently slide the galette and the parchment paper onto a large baking sheet. Using a pastry brush, lightly paint the egg wash onto the dough. 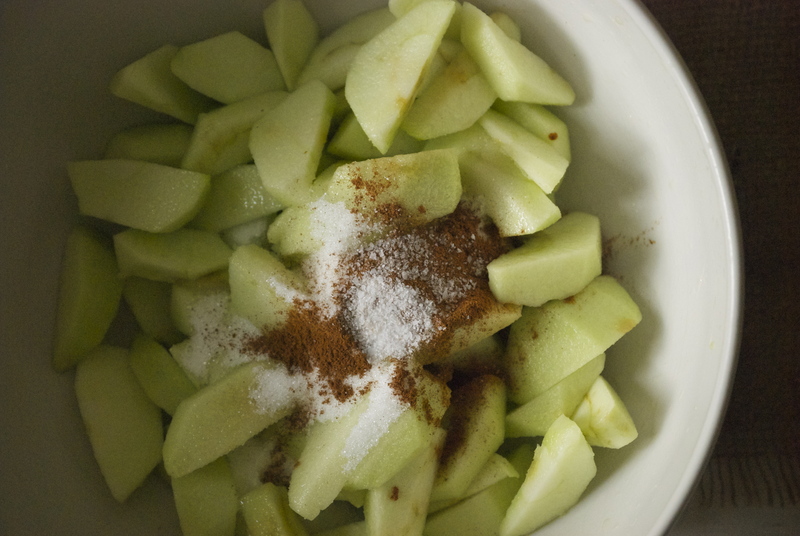 Then sprinkle with the turbinado sugar. 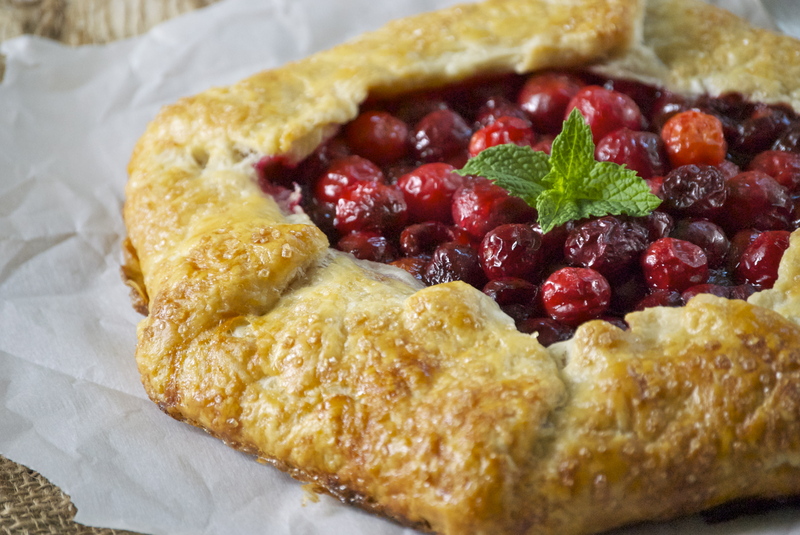 Place the baking sheet into the oven and bake for about 45 minutes, or until the crust is a deep golden brown and the cherry juices are bubbling a bit and possibly oozing out. Let cool before eating. Keeps well in an airtight container. Enjoy!